“If you’ve never had Barnaby’s of Northbrook, you really haven’t had Barnaby’s.” This is a commonly used phrase by the faithful fans of this pizzeria when speaking to people that have had Barnaby’s at their other locations, and think it wasn’t that big of a deal. The consistency is all over the place. I’ve eaten at some of the other Barnaby’s locations that were not just inferior to the Northbrook location, they were inferior to most pizzerias anywhere. Barnaby’s The Family Inn was started by Angelo Geocaris as a concept called the Brown Bottle in the 1960’s. They changed the name to Barnaby's because Schlitz Brewery operated a courtesy room with the same name. At one point Barnaby's had dozens of locations throughout Illinois, Indiana, Wisconsin, Florida, Ohio, and other states. The buildings were usually built the same, with a windowless restaurant, dark wood tables and booths, and no servers. They almost had a medieval feel to them. When I first started going there in the late 70’s you would got to a table, and would mark off what you wanted with a golf pencil. Then you’d take it to the cashier who would then give you a number. When your number was called, you’d go up and get your food. There were some drawbacks. For one, a windowless room didn’t appeal to many people. Two, Barnaby’s were notoriously smoky inside. If you read some of the threads on LTH, you will still see reviews that mention how awful the interior felt. Three, even though they were a “pub” they didn’t always have a bar where you could sit. You’d pick up your drinks at the “bar” and sit at your table. One by one, they closed. Maybe it was the atmosphere, maybe it was the food. Today, there are 4 left in the Chicago area (Northbrook, Niles, Des Plaines, Arlington Heights), 2 in Indiana, and 1 in Florida. In the mid-1980’s the Barnaby’s in Northbrook had a complete renovation. They added – WINDOWS! They brightened up the room, they added brass railings to give it a pub feel, and they added some round tables for bigger parties plus some private round tables in a separate section. This made the restaurant much nicer than any other location on those features alone. The remaining Barnaby’s are all individually owned, so the recipes are all over the place. Most of them still retain their unappealing original restaurant layouts as well. All of them have you order at the cashier now. The Northbrook location still has you order your drinks at the bar that you can’t sit at. For me, most of my friends, and my family, this is probably our favorite tavern style, cut in squares, thin crust pizza of all. The crust is what really makes the pizza like no other. From the crunchy, scalloped dough edge, to the cornmeal dusted, cracker thin, almost beer like tasting crust, to the peppery pizza sauce, to the great toppings, to the always cooked to a perfect golden brown cheese, this is a special pizza. If you love sausage with fennel in it, this is some of the best you’ll ever have. I can’t personally speak for the other toppings as I’m pretty much a cheese/sausage guy, I know people that absolutely love the pepperoni, or even jalapenos and fresh garlic on the pizza. It really doesn’t matter, it’s all great. They have a vintage rotating oven (could be a Fauld’s) and you can watch them making the pizzas if you want. You won’t see deep dish, stuffed, pan or any other style of pizza here, just the classic thin. The burgers are a real sleeper, especially the Angus Burger which is usually on the specials menu. The French Onion soup is a big favorite. Lots of other sandwiches, pasta dishes, but I honestly haven't tried them, so I can't comment. There are always a good dozen or so specials for lunch and dinner on a menu board by the cashier. After 4:00 they even have a pimento cheese spread with Ritz Crackers that people go nuts for that is provided for free. On Friday, Saturday and Sunday nights from 5-8pm this place is a madhouse, so beware of those peak times. Otherwise there is plenty of seating. They have a decent lunch crowd as well. They don’t even do delivery though they have experimented with it. They do par-baked pizzas that can be frozen which is heaven for people who like to stockpile them or don’t live in the area. Don't forget the heart shaped pizzas on Valentine’s Day. I am nominating this restaurant for a long deserved GNR because I know there are a legion of Barnaby’s of Northbrook fans who love this place as much as I do. The irony is that we have to convince people who have eaten at the other Barnaby’s locations that this is so much better. I think because the Barnaby’s name is not really associated with truly great pizzas because of their reputation, a lot of us Northbrook lovers are a little shy about saying this is one of our absolute favorite pizzas anywhere. Please do not dispute this nomination based on you only having Barnaby’s elsewhere, this is solely based on the Northbrook location. Thanks. Conveniently located right next to the Edens Expressway on Skokie Blvd, it’s worth the drive. Image of the Des Plaines Menu from a long time ago. I definitely second this nomination! When I found LTH Forum, one of the first things I did was check out the Barnaby's Northbrook thread to see 1) if the people here knew about the best pizza in the chicagoland area and 2) if they fully appreciated its perfection. Upon seeing both, I knew there would be people here with whom I could share the joys of food in Chicago. In all seriousness, I know that there are differences of opinion regarding this style and there will be some who, for whatever reason, cant stand the place. But Barnaby's Northbrook is the pizza to which all others are compared in my book. And, for me, as representative of the neighborhood restaurant as any on our list. So happy to see this nomination as I was strongly considering making it myself!! I love this nomination. I've said it over and over again on the main Barnaby's thread -- this is some truly distinctive, delicious, tavern-style pizza. It stands out as being unlike anything else I've ever had in Chicagoland. I crave this pizza and have been eating it for over 40 years. There's nothing artisanal about it but it consistently scratches the itch in a soul-satisfying way. As Ram4 mentioned in his nomination, the Angus burgers can also be great and I do occasionally order them but the thin, cornmeal-assisted-crust, pizzas are the thing. Back when I started eating here in the early 1970's, a light would flash at your table when your food was ready. There was one light for pizza orders and one light for sandwich orders. As a wee lad, it was torture sitting at the table waiting for the light to illuminate. But when it finally did . . . yay! Fwiw, I believe this is the best thin-crust pizza north of Howard Street (that isn't in Wisconsin ). Again, it's not artisanal but it is wonderful. The sausage is fennel-heavy and I know many who consider it to be their favorite. I definitely like it but my favorite order is a pepperoni and onion. That's been my go-to combo at Barnaby's for the last 3+ decades. I do have to say that I'm glad this nomination is only for the Northbrook location. I've never had pizza I liked nearly as much from any of the other locations (and they are now independently-owned). In fact, even though my office is less than 1.5 miles from the Niles location, when we want Barnaby's for lunch, we drive up to Northbrook to get it. Not all Barnaby's are created equally. 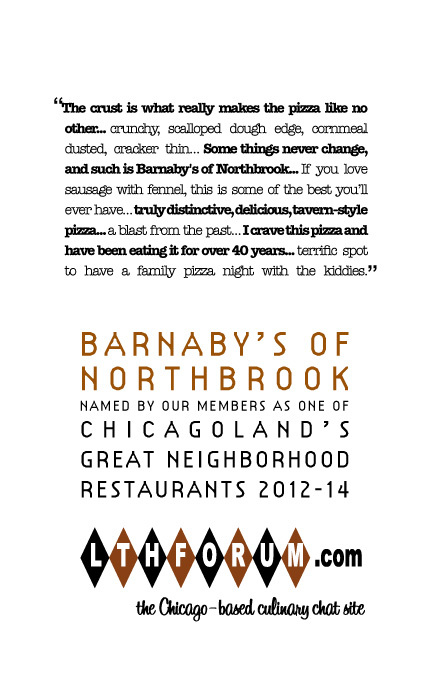 Northbrook stands out not only among other Barnaby's locations but in the Chicagoland area as being some of the best, most distinctive tavern-style pizza available. I fully and enthusiastically support this nomination. Before reading any further, please note that I haven't eaten here -- or any Barnaby's -- since the late 70s. At that time, this was about the only place in Northbrook open past 9PM, so it became a hangout for me and my friends. That being said, we did not like that pizza... but the things we disliked about it (cornmeal on the bottom of a crisp crust, baked to a temp hot enough to melt the plasticware) are things that I look for in a thin-crust pizza. I may have to check this place out again just to see if my tastes have changed that much -- otherwise, I'd have a hard time endorsing this nomination, just from bad childhood memories. So happy to see Barnaby's nomination! As a toddler, my parents used to take me here because it could be welcoming to a noisy, active 2 year old. Thirty-some odd years later, it remains my favorite thin crust anywhere. I love the crispy, cornmeal crust, zesty sauce and just the right amount of toppings. We live in the city, and we don't make it to Northbrook all too often. But my wife and I now have a bit of a traditionSince our dentist is located in Northbrook and we tend to make Sat. morning appointments for our cleanings, they are always followed with post-dentist Barnaby's lunch (and then Garden Fresh for her to get Israeli treats). Great nomination. My mouth is watering just looking at those pictures. I'll add my vote for a GNR. I grew up on Barnaby's and have made sure to take my kids here as often as possible. This blast of nostalgia is one of the things I will miss when I move to Denver in June. I think I need to round-up some folks from the office and head over to Barnaby's on Friday for a long lunch. Long overdue!!! I moved to North Carolina three years ago and whenever I come back for a visit, Barnabys is always on the list of stops. I've been a Northbrook customer since 1974 and it's a hard habit to break. While I'll always miss watching for that blinking red light at the table telling me my pizza is ready, they've more than made up for it by adding Filberts root beer and black cherry on tap. Great nomination Ram4. If anyone is heading to Asheville please pick me up two large half baked sausage and green pepper. I'll buy the drinks here. Barnaby's is fine pizza. I grew up in Glenview, and we went there on occasion, and my brother worked there for a while when he was in high school. But it sounds like most of the support for Barnaby's is based more on nostalgia than the actual quality of the food. I'm not convinced it's GNR-worthy, but I might change my opinion with some compelling arguments about how the pizza itself is so much better than many other thin crust places around town (which might prompt me to go back again and re-evaluate). I think this place is something you have to grow up with to like. I find the sauce oddly too salty and too sweet at the same time. I dislike the atmosphere at Northbrook, I've tried it 6-7 times in small to med sized groups and have never felt welcome or comfortable there. There's also an odd greasiness to the pizza I can't put my finger on. It creates an aftertaste I don't care for. Keep in mind I'll eat Alberto's thin crust so a little (or a lot) of grease doesn't scare me off! I give it 1-1/2 meh's. I agree there is a strong nostalgia factor at work here. Barnaby's is five minutes from me (but I didn't grow up here) and I took my kids there plenty after soccer games. The pizza never did much for me. More to the point, never in my wildest dreams would I think of taking out of town guests to Barnabys, even those it couldn't be more convenient. Great Rec. There used to be more of them but alas the only ones I know are in Northbrook and in Morton Grove. We like this place for carryout. It reminds us of pizzas from Fox's on the south side and Jake's. The Jake's on Waukegan Rd. in Glenview is pretty good for take out but Pizanos down the road has taken a lot of buisness away from it. I've been to Barnaby's a few times and thought the pizza was average. Due to the pizza being average is the reason that I go back infrequently. I've read all the praises for the pizza and I just don't get it. Sorry. I couldn't recommend this for a GNR. I would go if I was in the area, but I wouldn't make the trek there, unlike my experience at Burt's. The crust was just okay the couple of times that I went. This is a perfectly serviceable restaurant & I love the root beer on tap, but this is not a GNR nomination I can support. Last edited by pairs4life on March 25th, 2012, 6:52 pm, edited 1 time in total. I think that the pizza at Barnaby's is excellent, if you are a fan of that style of pizza, which I am. Still, I have lived not too far away for 20 years, and I used to work right up the street, and I doubt I have been there more than 6 times in my life. I dont like the atmosphere and the self-serve setup, and it is a bit too far from home for carryout. There are other excellent examples of that style of pizza up here, notably the Silo in Lake Bluff, so I dont see how Barnaby's is GNR worthy. 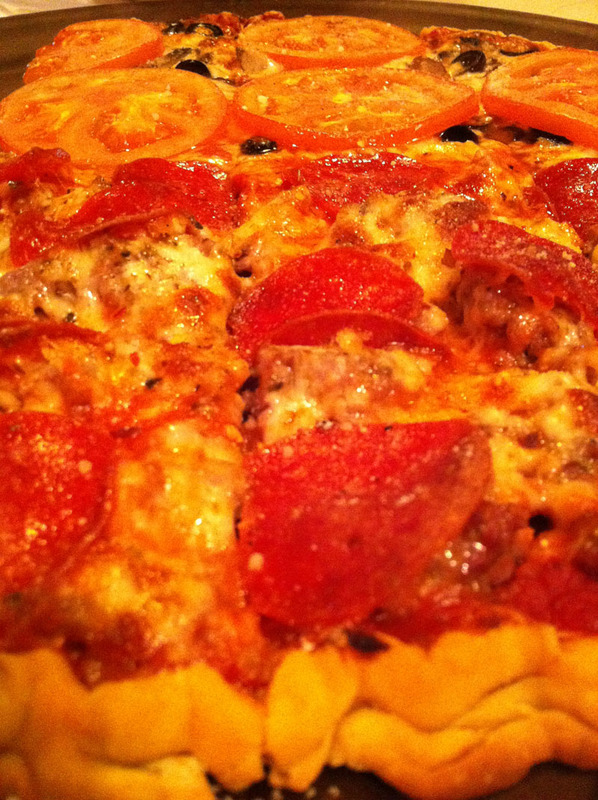 WillG wrote: I think that the pizza at Barnaby's is excellent, if you are a fan of that style of pizza, which I am. Still, I have lived not too far away for 20 years, and I used to work right up the street, and I doubt I have been there more than 6 times in my life. I dont like the atmosphere and the self-serve setup, and it is a bit too far from home for carryout. There are other excellent examples of that style of pizza up here, notably the Silo in Lake Bluff, so I dont see how Barnaby's is GNR worthy. I'm surprised to read this. Love it or hate it, Barnaby's style is really distinctive; polarizing even. I've been to Silo many times and I don't think the styles are comparable at all. Silo's thin-crust is much thicker, it's less short and there's no corn meal. That said, I can understand why one wouldn't like Barnaby's (poor, misguided souls ). Meh. It's no Candlelite (which got jobbed in a big way, IMO). Acutally Ronnie, The Silo's thin crust is super thin and does have a little gritty cornmeal. It's also not as good as Barnaby's. Ronna and I stopped at Barnaby's over the weekend and split a pizza. It was her first visit in many, many years and my first ever. I found Barnaby's pizza to be very unique and right up my alley. It was heavily sauced, but had the thinnest crust I've ever encountered; more like a crisp pastry shell than a pizza crust - very interesting. I also quite liked the sauce itself, which was very tart, with barely a hint of sweetness, and the fennel-heavy, coarsely ground sausage. We destroyed most of a large sausage pie with 1/2 jalapeno and 1/2 green olive. I liked it quite a bit more than another old-school pizza joint GNR that will not be na... [cough]Marie's... [/cough]. I also dug the vibe of the place and can easily see how it inspires nostalgia in you North Shore types. It does not appear that the place has changed a bit since the 70s. It seems like a pretty terrific spot to have a family pizza night with the kiddies. On this single visit, Barnaby's struck me as quite worthy of a GNR. Will repeat. Had to be someplace in Northbrook last night after dinnertime, so it was a perfect opportunity to hit Barnaby's again beforehand! ( after a tough deliberation between Barnaby's and Walker Bros.) A real treat to get out there so soon after our last visit. Like a few weeks ago, the wife and I split a large pie -- my half sausage & pepperoni, hers with some veggies. Every bit as good as it always is. Reiterating my vote for them to receive a GNR. I've always been ambivalent about Barnaby's pizza. I like it, but I didn't grow up with Barnaby's being a place in my regular rotation for pizza. I've eaten there a couple of times in the past year. Once with a group of LTHrs and another time last Wednesday night with the Chow Poodle. It was her first ever visit and immediately upon walking in she commented on how it looked like an old time pizza parlor in her home town in Michigan; instant nostalgia for someone who had never been there before. We ordered a pizza and while we were waiting had some garlic bread and a tossed salad. The garlic bread was nothing special, but for what it was, the tossed salad was very good. It delivered on the promise of fresh, crisp lettuce and other veggies. As we were eating our pizza, which earned a big thumbs up from The Chow Poodle, I started telling her about how Barnaby's used to be a hangout for little league teams and other high school activities for lots of folks. Almost on cue, the Highland Park baseball team came sauntering in to occupy a table next to us. Some things never change, and such is Barnaby's. I definitely support it as a GNR. It's such a part of its community and has been so for so long that it just makes sense to award them a GNR. I definitely support this nomination. As many have mentioned the pizza is unique and in my opinion crave worthy. The atmosphere is definitely different, but that is part of the charm. Been going forever and still love it! Sue and I went tonight - it's one of the closer noms to our suburban abode, and I've been lax in my explorations of GNRs. Well, it's a lot better than I remember from my teenage self... It's pretty good pie, but Great? I don't think so. The crunchy fluted crust is the best feature..but otherwise it's a little bland and boring (Sue, more generously, called it well balanced). The sauce at my local fave, Mug's, is much tastier, and that crunch can be had with Malnatis's thin crust. What it really boils down to is... Am I hankering to go back again? No. Not like I want Burt's. Not like I want Aroy's soup, Poochie's char salami, Paradise Pup's cheeseburger, LSC's Chicken Crack and lamb with cumin. Barnaby is not in that class. JoelF wrote: Am I hankering to go back again? No. Not like I want Burt's. Not like I want Aroy's soup, Poochie's char salami, Paradise Pup's cheeseburger, LSC's Chicken Crack and lamb with cumin. Barnaby is not in that class. I live just far enough away from Barnaby's that it is not a regular pizza go to. I only tried their pizza for the first time about five years ago when visiting a friend nearby. I liked the finished edges on the crust. I like the cornmeal crisp crust very much. I really like the pimento cheese I eat while waiting for my pizza to cook. Due to the crusts composition, it retains its crispness. This cannot be said for other thin crusts where you race to finish before wilts and cools. While I would not travel for it, I understand why others consider it a GNR.